One of the things I love about running this site for so long is seeing how some of my favorite recipes morph. Outside of developing recipes, I don’t measure. I go based on whatever mood I’m in and never cook a meal the same way twice. This millet egg bake is the perfect example. This egg bake started out in ramekins, topped with gouda cheese and various herbs. This updated version keeps the same feel but I’ve added dill and vegetarian parmesan. You can always use whatever you have on hand, but this is currently my favorite version of this recipe. On occasion (or always) I end up having extra grains I’ve cooked up for a meal. This egg bake is great for using up those excess grains. 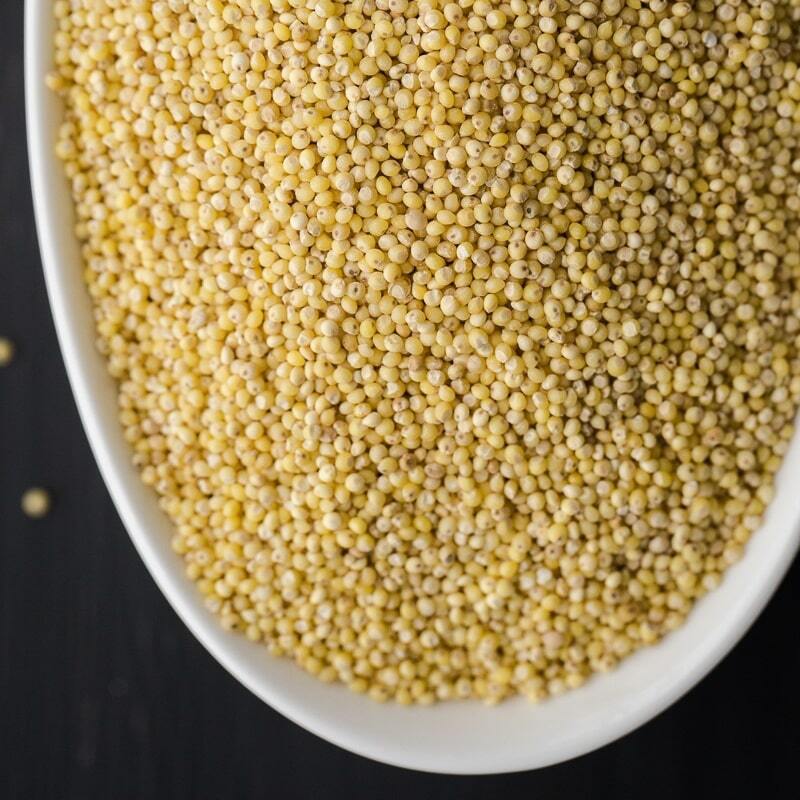 Feel free to substitute in quinoa, rice, or any other of your favorite grains. I use around 1 cup of the cooked grain to replace the 1/2 cup uncooked millet. In a medium pot over low heat, add millet to lightly toast for 2-3 minutes. Pour in 1 1/2 cups water and a small pinch of salt, bring to a boil, and reduce to a simmer. Cook until water is absorbed, 15-20 minutes. 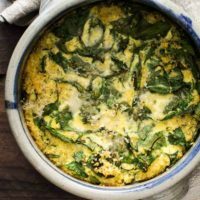 Combine millet, spinach, Toss millet and spinach together and place in a 8×8 or 9×9 baking pan. Whisk together eggs, milk, salt, and dill. Pour over spinach/millet mixture and lightly smash millet down until covered by eggs. Place cheese on top and lightly press down again. Bake for 25-30 minutes until the egg mixture has set and puffed up. Tips + Tricks: The millet will absorb liquid if left to sit for long. If you’re looking to prep this ahead of time, I recommend keeping the millet separate. You could also bake, store, and reheat before serving. Grains: I’ve made this with various different grains. It’s great with quinoa but bulgur or freekeh are also night. I tend to stay away from the chewier grains in this egg bake but you could certainly try. Cheese: Use what you have on hand for the millet egg bake. I like the saltiness of the parmesan but any cheese that melts is solid. Vegetables: I love to add in any leftover roasted vegetables I might have around. Asparagus, tomatoes, zucchini, or potatoes are all lovely. Both of the resources you shared? LOVE them. When I watched Kelsey’s video, I told Tim, I want this life. And when I read Sarah’s post (just this morning), it made me cry. This sounds like a wonderful recipe to try. Which cheese do you suggest using? Just below chives it says “12”. It looks like it could be an ingredient, but not certain. That’s my kinda breakfast , actually more like ‘weekend brunch’. Thanks for sharing those two inspirational links.. loved it! Oh I know exactly how you’re feeling. It’s as much as I can do to muster up the coherence to write a sentence, let alone a whole post. And, in my incoherence, I forgot to say what a wonderful way this is to use up leftovers. I love quick and tasty meals like this. Leftover grain in eggs is definitely on my short list of great breakfasts. I usually just scramble mine, though–so I’m eager to try your baked version! This is so easy and tasty looking! Mmmm. Totally dinner tomorrow. you are so sweet, erin. seriously. how long until you return home? Yum! I usually make a big batch of grains and beans on Sunday and use them throughout the week. I really like the idea of using the extras this way. I always end up with extra grains when I’m cooking. Thanks for giving me a totally different way to use them up. I’m looking forward to trying this! ooh, smoked gouda. I like it already. Thanks for posting this recipe—I’ve got some extra quinoa I need to take care of. 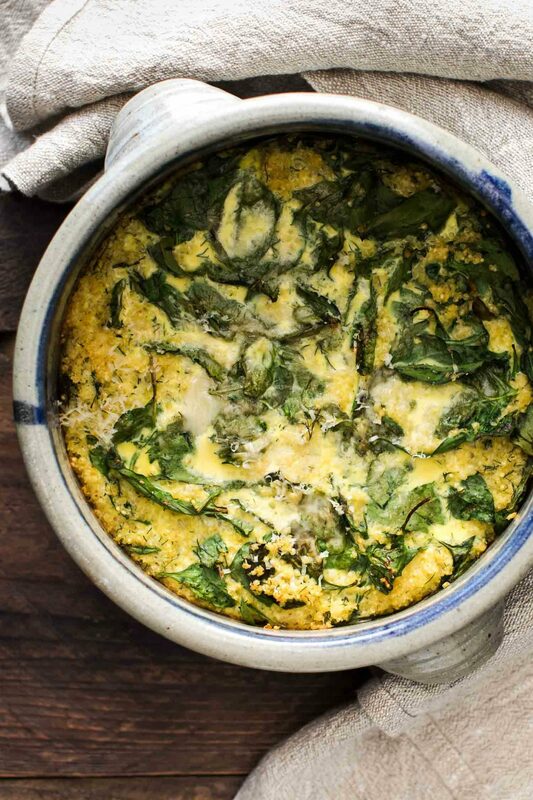 can you make the spinach egg bake in one casserole for four people doubling the recipe? This sounds perfect for an upcoming brunch I’m hosting. Do you think it would work with a stone ground cornmeal (instead of millet)? Just trying to use up what I already have! I’m really not sure about that- millet is a grain as cornmeal is more of a flour. The texture may turn out to be a bit off! I was out of spinach so I used kale. Very good. You preface this as a recipe to use leftover millet, which I take to mean some that you have cooked already, and then you call for uncooked millet. I’m confused. I’ve updated the lead in- I wanted to give the option for both as sometimes one doesn’t have leftover grain.